ANDALUCITA There is 1 product. Tear cut andalucites. Weight: 1.45ct/ 1.00ct Size: 10x5x4mm/ 10x5x3mm. 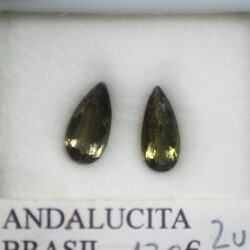 Andalucites from Brasil. 2 units.